At Eli's follow up appt. with Dr. Ramsey on the 17th, we talked about his hands and how they aren't ever in fists, and sometimes they rhythmically jerk. Dr. R was able to get us an appointment up at PMC with a neurologist for the following Monday. When I called up their they couldn't get me in until June 24th, I am grateful that Dr. R helped us get a closer appointment. At his appointment, they did observed him and I talked about what kind of things I was seeing at home, his delivery and his stay at the hospital. They think what has happened is that his brachial plexus nerves were stretched during his delivery because he was so big. They are going to run an EMG on May 11th, which entails putting a needle in two different nerves on arm and then sending an electric pulse through it and timing his reaction. We are also doing some work with him here at home, moving his fingers and bending them and stretching them out. I am happy to say that we have seen improvement, he will now grip our fingers sometimes and he moves his fingers more often. We saw Dr. R in the afternoon for his 2 week check up after his visit with the Neurologist. He told me that he has never seen this kind of thing be permanent, because babies grow so quickly that their bodies can regenerate and self heal the nerves. I found that very comforting because on the way home from PMC I was crying as I was talking to Jed about what I found out. I was feeling like if I would have had him by c-section he wouldn't have this challenge. Jed, Dr. Ramsey and Suzanne reassured me through out the day that it wasn't my fault and I could spend forever saying "If only." He got to have his first bath last Saturday the 24th. He loved it. I loved it too, and Ruby and Emma were my bath assistants. They kept using the wash cloth and sponge to keep his tummy warm by squeezing the water on him. He is such a good little guy and I find myself thinking that adjusting to 3 children a lot easier than 2. I think it is because the girls have each other to play with and they keep each other busy, and Eli is so content and relaxed. We had fun Saturday working in the yard and cleaning out our flower beds and going to the park. It was so nice to be home on Saturday together. We had a little mishap recently in our home. I was feeding Eli, Emma was in bed, Ruby was in her pajamas when she appeared in the living room with out her glasses. I told her to go get them and she just stood there. Then I asked Jed to get me a burp cloth. A few seconds later I hear Jed pipe up "Oh crap!" I asked what was wrong and her came out with a pair of mangled glasses. Dear little Ruby left them on the floor. We have talked with her time and again about putting them in the case or on her face. We have had other moments where Emma has gotten her hands on them and bent the arms. So this was the final resting point for her glasses. I felt sad when she putting her face in her hands and saying "Ohhhh, now I can't see." I was thinking we would have to order a completely new set but upon calling Target, we found out that if the lenses were ok then we could just replace the frames for half the cost. I liked that. She was without glasses for a day and a half until we could take her to get them replaced and sized. It was mildly irritating, but if her glasses wouldn't have been broken we never would have snapped this little beauty. We have some doubting family members that Eli ever has his eyes open. :) He is such a content little guy and is very easy going and yes, he loves to sleep. It is such a treat having him in our family. The girls love him. Ruby loves to hold him and Emma likes to help feed him, and ask what is wrong with him and how his owie is. When he was in the hospital and they were finally able to wheel him to window so the girls could see him Emma was convinced he had an owie and would tell people that he had one. He is such a cuddly little guy, and I love how warm newborns are. I love cuddle time in the lovesac in the evening. We haven't been able to give him a bath yet, because he still has lost his umbilical cord, but are looking forward to the event. Without further ado, our little guy with his eyes open, and I think a few sleepy one's slipped in. On Monday evening I had the nurse take Eli to the nursery so I could get some sleep, I also got to take my good friend Ambien. We make a good team when it comes to hospital stays. I slept really well and was looking forward to going to the nursery to pick up my son. Before I could make it to that point, Eli's ped came in for visit. He told me that when they brought him in, the nurses noticed that he was breathing really fast, for most newborns they take about 60 breaths a minute or less. Eli was taking 120. I was told that they wanted to keep him in there so they could watch him and make sure he was breathing ok. They also ordered for him to be on a liter of oxygen to help expand his lungs. Sometimes when babies are Eli's size and even though they are full term their lungs haven't caught up to their size and need a little help. He also had fluid in his lungs which is usually only present in premature babies, and somewhat unusual in vaginal births because it helps get any excess out. So he was on an IV for antibiotics, and later for feeding because they found that his oxygen levels would drop after he would eat and he would turn a dusky color. So he was then put on an 02 sats monitor and also a respiration monitor. The reason his o2 sats would drop after eating is because he has acid reflux it took 3 days to figure it out. As I think back on it, Eli's hospital stay is somewhat of a blur. For me it was just 4 1/2 emotionally charged days. 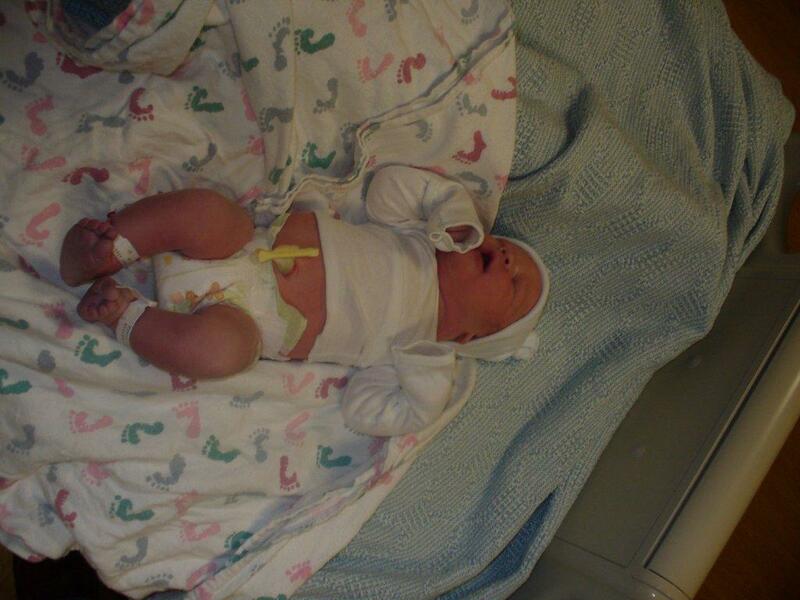 I have heard many times of babies that have to stay in the hospital or the nicu, but I started to truly understand how traumatic it is was when it was my own child. The nurses and his ped were fantastic, even when it was crazy in there with a lot of deliveries or some babies being transferred to the nicu I always felt like someone was checking on me or putting an arm around me and offering a box of tissues. I felt like what was happening to our family was important to them and they wanted to take care of us. We have had so many sweet and tender mercies extended to us during the past week. We have felt the Saviors love through others kind gestures, cards in the mail, help with the girls so Jed and I could go and be with Eli together, phone calls and many reminders that we were being prayed for. The end of the day when Jed would take the girls home was always hard, Ruby would cry and tell me I need to get in my seat in the car and come home. Jed would tell me to turn around and go back into my moms house and that Ruby would be asleep in 5 minutes, and that I was where I was supposed to be. It was so hard being away from Jed and the girls and I missed home, but the thought of being 45 minutes away from Eli was unbearable. Jed was such a strength to me and basically took over the home front so I could be with our little guy. I promised Ruby I would be home Friday night, because I knew how hard this was for not only us but also for our girls. Come home I did and it completely opened the flood gates when we walked in and I saw Eli's little bed empty. I tried to busy myself with dishes, but Jed pulled me away from them and just held me while I cried. Thankfully we got the phone call Saturday morning that he was able to keep his 02 sats up for 24 hours and that we could come and bring our little boy home. Jed and I were a whirlwind of activity getting the girls ready and diapers bags packed. We couldn't hurry fast enough. We stayed at the hospital for 1 1/2 hours so he could have his car seat test, and make sure he could breath in his seat. He passed and we got to bring our son home. It feels so incredibly good to be together as a family again and have some semblance of normalcy again. We are all doing really well, and loving our little bubba. Monday our day started out at 4:42 a.m. because we forgot to set the alarm. Good thing I woke up! We hurried out the door and packed our sleepy little girls, who were now perfectly alert into the car and headed on our way to my mom's who was watching them for the day. As we arrived we got the girls settled and Jed and my dad gave me a blessing. It was so comforting and sweet. We got up to the hospital and got signed in and they pretty much prepped me for a c-section because of the possibility of needing one if the EV failed. With my last EV they did it without any pain medication. This time however since he was going to be coming one way or the other, they wanted to have the IV line open in case of an emergency so they could quickly give me a dose of meds. I can't even begin to say how incredibly comfortable I was while the EV was happening because the epidural. Jed said as he was watching, they would push into my stomach about six inches and hold it there and then do it in another spot to try to get him to flip. He absolutely was not going to budge going to the right, so they attempted to get him to go to the left, and they were able to flip him! That was such exciting news to me simply because I didn't want a section, and we had waited 6 days hoping this would be the outcome. They broke my water, and were very careful about slowly adding the internal monitors every hour or so. They didn't want to give him any extra room to move around. I was pretty comfortable pain wise for about for about 4 hours, but every time I was about to fall asleep the blood pressure cuff would start beeping and we would have to call the nurse. At around noon, I started to get mildly uncomfortable, but we waited because I didn't want to max out on my pain med, and then not get to have any right before he was born. After about 30 minutes I wanted some relief so the anesthesiologist came in and gave me a shot to help. It worked fine until I would turn over and then the pain would come back. So over the course of the next two hours the anesthesiologist came back twice to see if she could help me. It would happen in the same pattern, I would feel better and then the pain was back fairly quickly. I was trying so hard to breathe through the contractions and just endure, which I did for the next half hour. By this point I was sobbing and holding on to the bed rail every time I would have a contraction. Jed hurried to get the nurse because he said it took to long for them to be paged. They came back about 5 minutes later to check me and my Dr. was there also, I was checked and was to a complete 10, and experiencing the worst pain of my life. Dr. Later told me that I could wait 20 minutes for the anesthesiologist to be done with a patient and for me to be numb or I could push with the contractions and have my son here in 5 minutes. I became a swearing woman that day, not during labor thogu I think I shocked Jed. I chose the latter, and let me just say without being overly verbose or graphic, I have such great respect for women who have or had natural births without pain meds. I felt everything and I now understand why they call the baby's head crowning "the ring of fire." I was so exhausted by this point and Jed said I just wanted to keep pushing, but he would tell me to wait for the contraction because it would make it more effective. With each contraction, my Dr. told me to get angry, using a little less voice and a little more muscle. (I didn't remember this, Jed filled me in later.) After about 6-7 pushes our "little" guy was here! 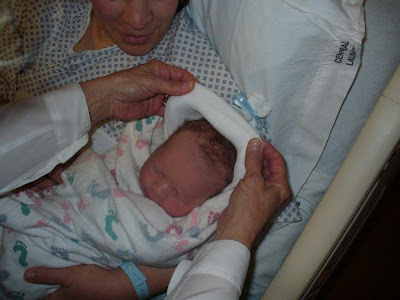 In my mind, it seemed like he was whisked away, my Dr. stayed to help me deliver the placenta and then it felt I was left all by myself and I was still hurting, exhausted, shaking (To which the nurse called over to me that it was perfectly normal.) Every one was over ogling at our big bubba. After about 10 minutes and what seemed like an eternity to me, they brought my son over and we got to cuddle skin to skin. At that moment, every last bit of pain I felt was gone. Best feeling ever when they put that little guy in my arms. He is such a sweet little guy. At first, I was thinking he completely looked like Ruby, but now he looks like a chubby Emma with a large dose of masculinity. We are so in love with him! He has such a calm nature, and the sweetest little lips. He is so fun to watch. I think of him as my miracle baby. Simply because, how in the world did he flip on his own with out getting tangled and then that he was able to be flipped manually weighing 10 lbs. 1 oz. My nurse told me that Dr. Later has the highest success rate at the hospital with EV's, and that if he had any inkling about how big Eli was, he never would have attempted the EV. I am so grateful we were in the dark about his size. Around 5:30 we had our first set of visitors. Jed parents came, my parents, Sarah and Adam, Erin and Phillip, and Lanette and Shaun. We had a good number of visitors, which I am glad because when I took him to the nursery for the evening they discovered that his respiration rates were 120, when they should have been around 60. Eli hasn't been able to leave the nursery, and we are just waiting for them to rule out what is causing his 02 stat's to drop, so he can come home. The nurses there are so fantastic and have taken such good care of Eli and I. I am grateful for them and I am so thankful for Jed pretty much taking over so that I can spend as much time at the hospital with Eli. That's a story for another time. This is Jed, Ashley's husband. I am writing a very brief post for her to let y'all know that Eli was born today. He was breach this morning but the good news is that Dr. Later was able to turn him so it was a normal birth no C-Section was needed. Here are a few pictures I did not bring my camera home so these are the pictures that my parents took while they were at the hospital. Oh how I love the Mama's and the Papa's! Anyway, received a call from the hospital this morning around 10:30 letting me know that I needed to come to the hospital today to do my labs for the possible c-section. They said that I needed to be up there before 5 p.m. We decided that we would have Jed go to church and teach his lesson and then come home at 3:00 to be with the girls. Both of them have colds. Ruby is on the mend but Emma is right in the middle of it. As we made this plan we were all laying in our bed. Emma was snoring, Ruby had her hands behind her head like she was at the beach and Jed and I were laying with our eyes closed. About 2 minutes later the phone rang, again it was the charge nurse at the hospital. She let me know that because it is Sunday the lab closes at noon, and if it was possible to make it up there in time. With our 45 minute drive I knew it would be close, but said I would hurry as fast as possible. I got dressed, rid myself of my mascara raccoon eyes, kissed the girls and headed to the hospital. I went to the maternity floor to get my paper work and I also got my hospital ID band, which shall remain with me until my stay is over. I was also given instructions for our arrival tomorrow. No eating after midnight. Check. Be to the hospital by 6:00 a.m. What!!! That was two hours earlier than we were planning on. So we will be up at about 4:30 a.m. tomorrow morning to get out the door and pack our sleeping children into the van. Now that I think about it, 2 hours earlier means meeting my son 2 hours earlier. I like it. I just feel bad for my sweet mama, She has been so amazing in helping us through this crazy past week and just doing whatever is needed. She is an angel. The labs were pretty quick, and painless (not so much now) and before I knew it I was ready to go. They drew tubes for my blood type in so they have my blood type on hand in case they need it, and to check for my blood count. When I returned home, Ruby came running and hugged me and then about 10 minutes later she said, "When are you going to the hospital? I want you to leave." I felt a little bad and looked at Jed. He explained that while I was gone she kept talking about Eli coming home, and that all she meant was that she wants me to go to the hospital so Eli can be born. That make me smile. The girls have been so good about being shuffled from place to place, but I think that they too are ready for their little brother to come home. Eli was pretty active last evening, I kept thinking in the back of my mind that maybe he was going to turn. I even dreamed about it, onlt to wake up and remind myself not to get my hopes up. Our little guy is still breech, but we have a for sure date now. Monday the 12th. We can handle that. I could give you the details of Monday but then perhaps it would make reading his birth story repetative later. So I shall keep the details to myself. Definetly looking forward to Monday and the end of this off schedule, up and down lifestyle we have been living for the past 4 days. Eli is still breech, but one positive note is that he is spine up. Yesterday he was laying on his back and today he is on his tummy. If he stays this way it will make our chance of success during the EV even better, because it gives the Dr. something to hold on to and give them a bit more leverage. As we were getting ready to leave, I mentioned to the nurse (since I was seen by the ultrasound tech) that Eli's movement didn't seem the same as before his burst of energy when he flipped. I attempted last night to do the self check where you eat something and then count movements for an hour, however I fell asleep before I felt even one movement. They immediately suggested monitoring me for heart rate and movement. We stayed for about an hour longer, and enjoyed the smorgasbord of juice, pretzels and almonds to encourage him to move since I hadn't eaten anything since last night. They said he looked really good, and that everything was ok, but to not hesitate for a second if I start to notice no movement or I have a gut feeling that something isn't right. It feels like I have been lacking in pictures lately so I think now is a good time to post newborn pictures of our girls. A little treat at the end of my verbose posts. Went in for the position check on Eli this morning. While I was in the ladies room, Jed was chatting it up with our MA and the office clerk. I love the staff that helps take care of us. As for Eli,he is bottom down legs tucked, with his head up. So the game plan is to going in for checks, Thursday morning, Friday morning and Monday. If he is in position at any of the appointments, they will immediately admit me and start the induction. If not, the appointment Monday will end with one more attempt to turn him manually and if nothing comes of it, then I will be having a c-section. I'm not sure if that will be on Monday or Tuesday. Either way it will put my sister and I with very close delivery dates. She is scheduled for a c-section on Tuesday. The end seems far away but I am grateful that my Dr. isn't anxious to rush me in for a c-section unless absolutely necessary. She commented on my blog yesterday about us being in the hospital together and getting to take the babies for strolls in the hall with their bassinets,and noshing on Lorna Doones together. 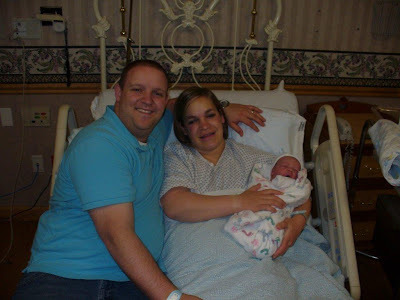 If we both have a c-section it would be nice to have such a good friend there, since both of our husbands will work the days we are in the hospital so they can have more time to help at home when we get to that point. It made me smile to think of the two of us being there together. I think after yesterday's experience I was in too much shock to really be able to judge my feelings. I put on a brave face as we talked with people but as the day wore on I was very discouraged, and cried a little once the girls were in bed and I was doing dishes. It finally felt ok to fall apart. I felt better afterward. I also slept better last night, which was much needed. On the way home from the appointment, Jed and I were both very quiet. I think we are both just exhausted from re-packing bags and making sure we have everything the girls need to stay with family that is watching them. Emotionally too it has taken it's toll. We get anticipating and hopeful and then feel let down when we have to wait another day again and anticipate the unknown. Jed has been a great support to me, and I am so thankful that his boss is so understanding and lets Jed come in late so he can attend these appointments with me, and allow him to play his schedule by whatever is happening with our baby. Our morning started early... but especially early for me. I couldn't sleep, Eli was moving all over the place all night long. I don't think a half hour passed that he wasn't in motion. Then with my arms going numb and the anticipation it made for a restless night. Gratefully 5:30 came and I was able to get ready to go to the hospital and get our girls out to the car. We dropped them off and were to the Woman's Center at 7:30. We got checked in dressed in my hospital gown, IV administered and answered all of the routine questions about my health and the pregnancy. Dr. Later came in to check for dilation and to break my water, when he gave the crochet looking tool that does the job back to the nurse, and was a bit more thorough with the exam. He didn't think that Eli was head down so they got the ultrasound machine and sure enough Eli bottom down and head close up to my ribs. We discussed my options. a)Wait it out, and see if he would turn on his own since he did so in the past. We went with the option to have the EV done. I was anxious because of what I had read and heard about the procedure. I was even shaking a little bit. My nurse was fantastic and answered all of my questions and was very helpful. Dr. L came in and I was given the shot to relax the necessary organ. Jed held my hand through it all and I closed my eyes and focused on taking small breaths up in the top of my lungs. It was uncomfortable yes but not at all as awful as I had anticipated. They attempted to flip him one way, and had him half way but Eli was digging his heels in and wouldn't kick his feet to finish the flip. They tried the other way with the same results. Dr. L said in all his years of practice he has never had a baby turn late on his own and then turn again. There is a first for everything I suppose. We stayed for one more hour to monitor Eli's heart rate and make sure that he wasn't in distress. During this time Jed and I made a few phone calls to parents. The game plan now is to go in each morning to see if he has flipped himself into the head down position, and if so they will immediately do an induction. If it doesn't happen tomorrow he said he would try to do another EV (I missed this bit of info. Jed just informed me.) on Thursday or Friday. After that I am not sure what will happen. We will have more information tomorrow and have answers to our questions. I talked with Sarah this morning and she offered to take care of my girls Wed and Thurs no matter the outcome. I am grateful for her thoughtfulness and willingness to help us out. Amazingly I am at peace with the results of today. Am I sad that we had to leave the hospital with no baby? Yes. But I am positive that it isn't the end of the world and whatever happens everything will be ok, and our son will be healthy and well. Jed and my dad gave me a blessing this morning and I was promised that I would feel peace, and that is exactly how I am feeling. More to come in our little adventure with our wiggle worm Eli. On a lighter note I am proud to admit that I turned the nurse down when she offered us cookies. I have a serious love for Lorna Doones and usually I clean house of the snack room when we are there. I will save my cookie fest for another day. I have been a complete slacker as far as blogging about my girls. :( So I am making a small attempt to catch up. The girls have recently become absolutlely obsessed with Toy Story and Toy Story 2. In conjunction with getting both combo packs it allowed us to print 2 movie tickets to see Toy Story 3 when it comes out in June. The girls are thrilled and talk about going all of the time. When ever I ask them a question and call them by their names they are quick to correct me that they are either a) Woody b) Buzz Lightyear c) Jessie or d) Bullseye and more often then not I am given the title of the Evil Emperor Zurg. It keeps things interesting around here. Ruby also finds great joy in telling us her "jokes" which usually consist of telling us a shortened story about one of the Disney Princesses, and even though they are usually lacking in the humor department Jed and I find ourselves unable keep a straight face due to her details and facial expressions. I do love one of Ruby's good jokes at the end of the day. Easter weekend was a lot of fun for us. We started out by dying Easter eggs on Thursday, and had a lot of fun with that minus a few spills which ended up in some of our socks dyed yellow. Friday, my friends from Sandy threw me a girls night out since I didn't want a baby shower. Some brought gifts anyway and they are all so sweet. I am so thankful for good friends. The girls were thrilled that they got to hang out with Morgan and Owen until Jed could get off work to pick them up. We went a little early to visit and Ruby kept asking when I was going to leave. They had a good time with their friends. Saturday we had an Easter egg hunt at my parents and had fun visiting with family that lives fairly close and enjoyed lunch together. We were there for most of the day, and after Priesthood session we swung by Jed's parents, it was so fun to see everyone but by the end of the day I was exhausted and ready for bed. Jed spend most of the first part of the day at work, finishing up the last of his tax prep for all of the corporations for his meeting today. It has kept him really busy over the past couple weeks and I know it will be a relief for him to be done with the meeting today. We missed him, but I am so thankful for all of the sacrifices he makes for our family. He is a good man. Sunday was so nice to be home as a family and get to watch General Conference snuggling with my little loves. I must confess that I fell asleep more than once, but thoroughly enjoyed the talks I was conscious for. We spent the rest of the afternoon reading books, playing Toy story and listening to Ruby's jokes. Jed and I switch each night putting one of the girls to bed. My evening ended with singing "Snuggle Puppy" with Emma. She absolutely loves that song, and I love the smile it brings to her face and hearing her jump in when she knows the words. I snapped this sweet picture of Jed and the girls just after dinner. Ruby asked Jed to draw a picture of Woody. Jed wanted to do his best work so he borrowed a coloring page of Woody from Ruby and during the drawing process he had the girls rapt attention. I love moments like this. I have so much to do today, most of it house work and packing. Truthfully I don't feel like doing any of it. So I guess I will just see what I get done and not worry about the rest. I just want to enjoy the day with my little buttons.